Maintaining an appropriate environment is a fundamental aspect of preservation. Temperature, relative humidity, pests, and air quality can all have a significant impact on the lifespan of collections. Controlling temperature and relative humidity is crucial for archival collections. Inappropriate levels of either contribute significantly to the deterioration of materials. Heat increases chemical reactions that breakdown media. High relative humidity can encourage mold growth and pest activity, while low relative humidity can lead to desiccation and embrittlement. The recommended environmental standard for paper-based collections is 35-65°F and 30-50 percent relative humidity (RH). However, different materials may require different standards. 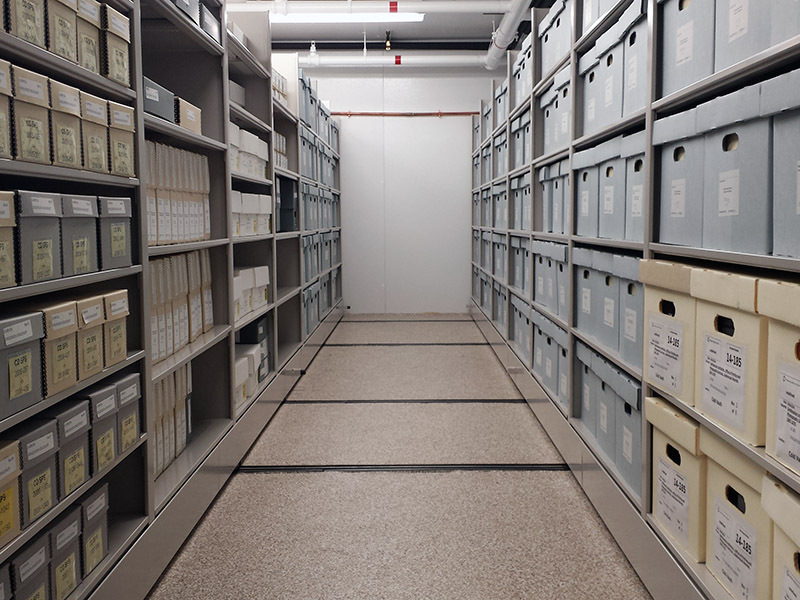 The Archives provides cool and frozen storage for selected photographic and film-based collections. In November 2015, over 3 million photographic negatives were moved to a new state-of-the-art facility at the (SISC) in Hyattsville, Maryland. The storage facility consists of two units that maintain different environments. Glass negatives, color photographic prints, compact discs (CDs), and magnetic video tapes are stored at 52°F (11°C) and 30 percent RH. Film-based materials, such as reels and still image negatives, are stored at 26°F (-3°C) and 30 percent RH. 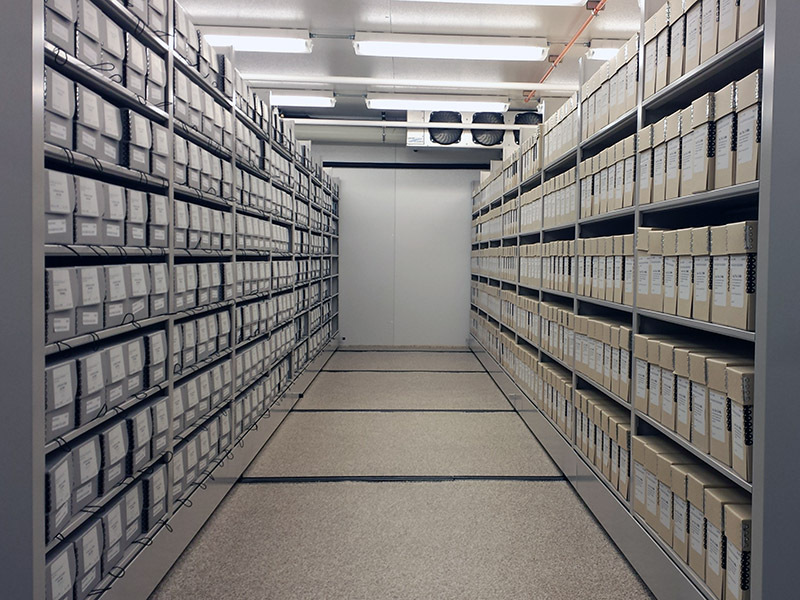 In addition to the storage at SISC, the Archives also has an on-site freezer for frequently accessed microfilm collections, and for the treatment of pests found in collections. The freezer is maintained at 18°F (-8°C). 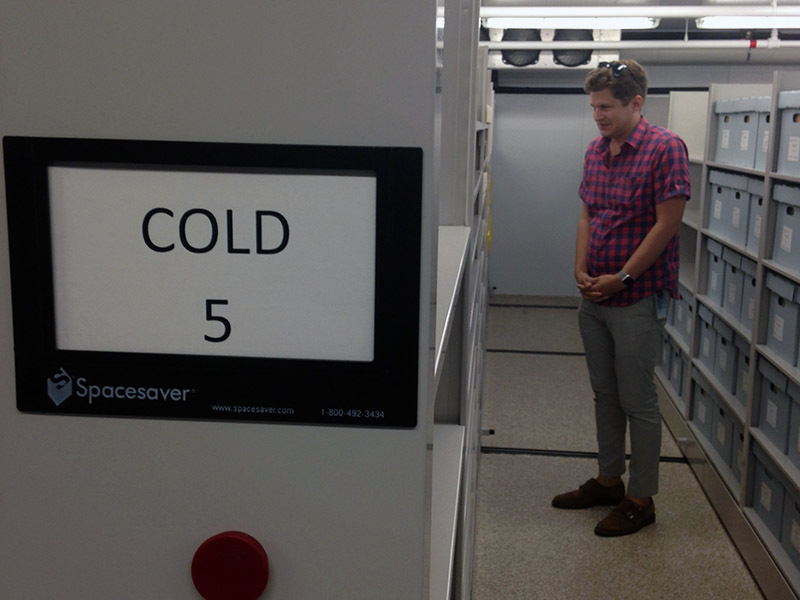 Smithsonian Institution Archives' staff explore their cold storage collections space in the Smithsonian Institution Support Center. The Smithsonian Institution Archives stores glass negatives, color photographic prints, compacts discs, and magnetic video and audio tapes in cool to increase the lifespan of the media and its content. William Bennett, Conservation Specialist, retrieves environmental data from the digital data loggers in cold storage. The Smithsonian Institution Archives stores film-based collections in cold storage to increase the lifespan of the media and its content. Broken glass-plate negatives require custom housing due to the fragility of the plate and to prevent further damage from occurring. These enclosures are stored flat in boxes and placed in cool storage. The temperature and humidity are closely monitored in each of the Archives' facilities that house records. Using digital data loggers, environmental data is captured and uploaded to web-based software that allows staff to interpret trends and spot variances. Collections are inspected regularly to detect and record any pest activity. Working alongside Smithsonian Gardens, the Archives monitors collections by building awareness of pests seen within specific collections, tracking those pests throughout storage and office spaces, and identifying trends. 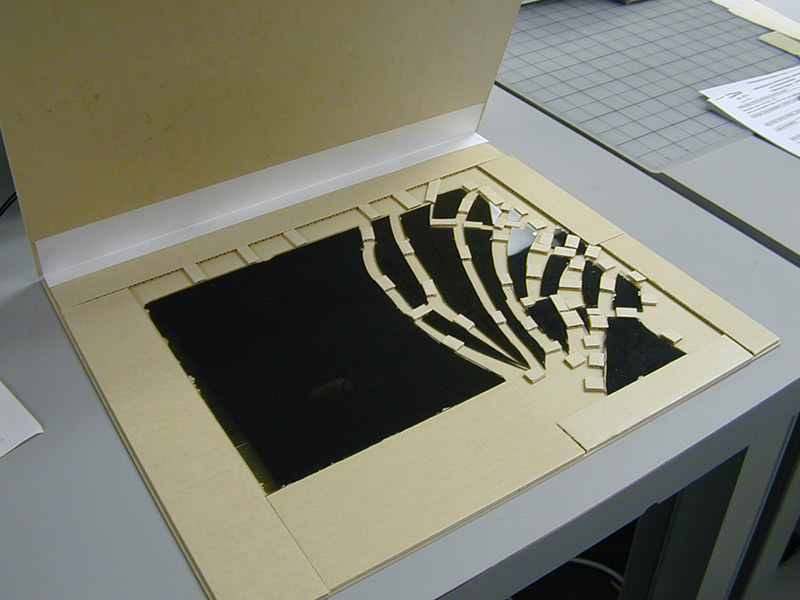 Pheromone glue board traps are used attract and trap insects. Controlling environmental factors and performing good housekeeping procedures will discourage pests from being drawn into collections areas. The Archives retains a cleaning schedule for all collections areas, which entails moving mobile shelving and vacuuming floors and shelves. This schedule also gives staff the opportunity to regularly inspect the collection during cleaning. More information about integrated pest management can be found at Museum Pests. One common, but often forgotten, cause of damage to collections is light. Paper, leather, and photographs are all susceptible to the effects of light, which include color fading and chemical deterioration. The Archives uses ultraviolet (UV) light filters on overhead fluorescent lights in collection spaces. Light levels are more closely monitored in exhibition spaces due to the increased exposure to light while on display. The Archives provides specific recommendations for light levels as part of loan documentation for borrowing institutions.